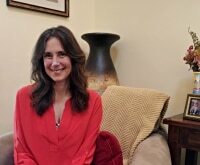 As the weather starts to tease us with spring flowers and warm sunshine, I decided to take some time to plan ahead and create a tasty Easter brunch cocktail for you. 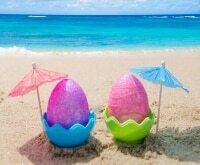 While the kids have their baskets in hand, searching frantically for colorful Easter eggs hidden between blades of grass and the occasional flowerpot, it’s cocktail time for the grownups! 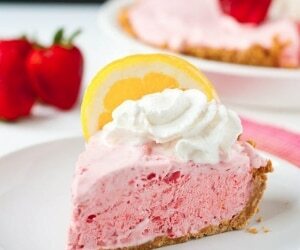 Where there’s Easter brunch, there are delicious beverages that abound…and I’m not just talking about bubbly mimosas. This year I’ve decided to take it up a notch on the fun meter, and let’s just say there’s a certain candy involved. Add a little vodka and what we have is the perfect brunch cocktail bar: A self-serve Skittles® Vodka Cocktails station! 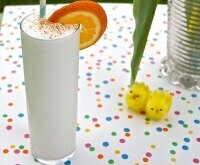 If you’re throwing an adults-only party, why not serve up this tasty Easter Lily Cocktail, too? 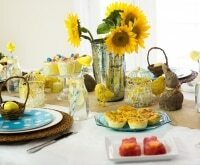 And don’t forget these adorable Easter-themed bird’s nest cupcakes to go with! 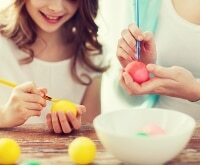 When you think of Easter treats, it’s classic candies that often come to mind, like chocolate bunnies or marshmallows. 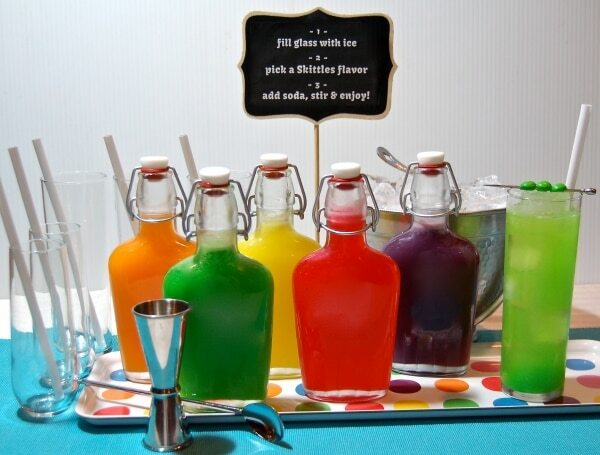 For the adults at your celebration, a brightly-hued cocktail could also be considered a special treat, and nothing beats a frozen bottle of Skittles®-infused vodka. 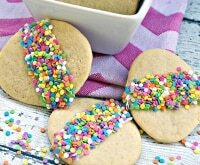 You’ll need to plan two days in advance to make yours, but with only two ingredients and a little patience, you’ll be thrilled with the results. Let’s get started! 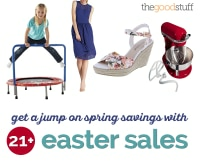 Don’t forget to check for Skittles® coupons and The Container Store promo codes! Organizing your table with all tools and ingredients ahead of time is essential. Make sure you’ve pre-washed all your bottles or flasks ahead of time. You may want to cover the area in paper because things can get a little sticky. Be sure everything you need is right at hand and things will go quickly. 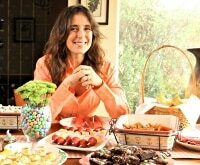 Pour all your candies onto the table and start separating them into individual colors. 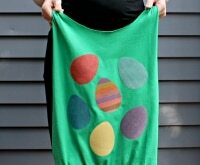 Place each color into its own container to keep them from rolling all over the place. You’ll need about 50-60 Skittles® per 8 1/2-ounce bottle. 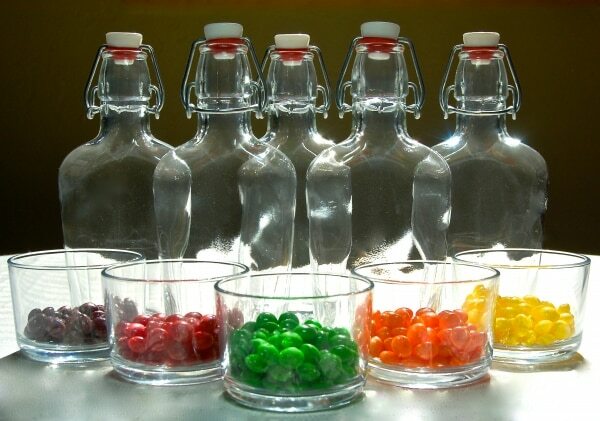 Place each color of candy into its own bottle. Using a small funnel, pour vodka into each bottle up to about a half inch or more from the top. You want to leave a little room at the top, so don’t fill it all the way. You should now have five bottles with Skittles® soaking in the bottom. Give each bottle a good shake and you’ll see the color quickly present itself. Let these bottles sit overnight for the best flavor infusion. 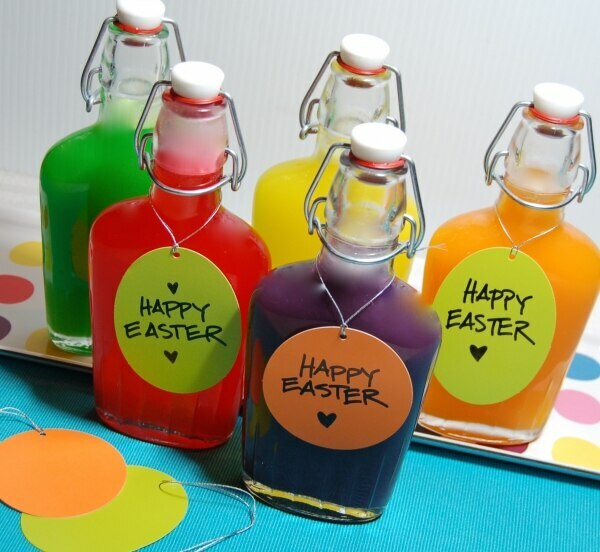 Every few hours, make sure to give each bottle a really good shake to help the candy dissolve. I shook mine about four to five times each to really activate the color and flavor. Here’s where you’re going to need the most time and patience! Your Skittles® infusion will now have a bunch of white gunk floating at the top of the bottle. We need to strain this out, so grab your mason jar or other cup along with the coffee filters. Fit the coffee filter onto the jar and wrap the excess filter around the edge to secure. 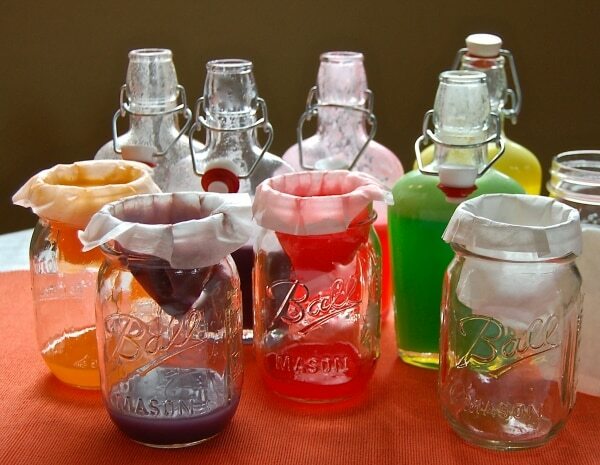 Pour fluid from each color into a jar, through the filter. You’ll have to wait as the infusion soaks through, then pour another bit in until all the liquid has been filtered. If the filter clogs, use a spoon to scrape the clog away or simply change the filter to a new one (that’s what I did). You can filter twice if you’d like your cocktail to be more clear and if you have the time — I recommend this. 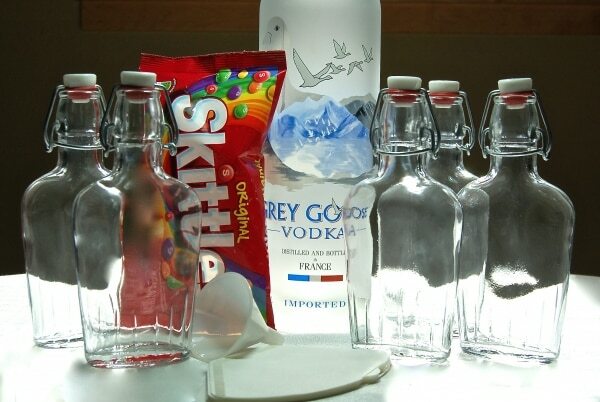 Now you’ve got five bottles of Skittles®-infused vodka! First things first, get those bottles in the freezer! You’ll want to chill these until you’re ready to serve and since vodka doesn’t freeze, you’re fine placing directly in the freezer. Now it’s time to set up your cocktail bar. 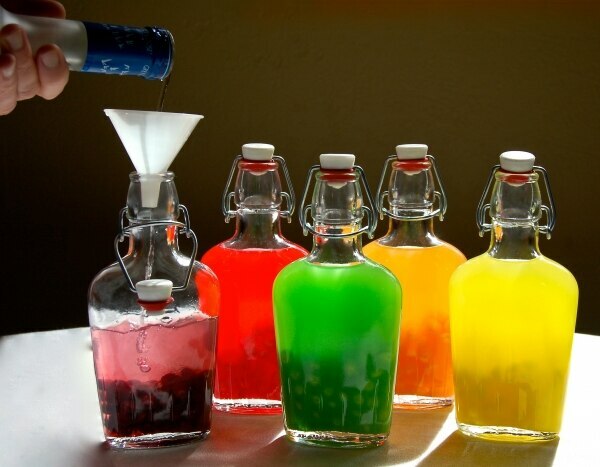 Since the sweetness of the Skittles® vodka carries quite a powerful flavor punch, the best way to serve this cocktail — and stay oh-so calorie conscious — is to simply add club soda! Set the scene for your self-serve bar with a shot glass (for measuring a shot of vodka per drink), a bin of ice, plenty of tall glasses, and some club soda and you’re ready to go. Guests will love picking their favorite Skittles® flavor for their cocktail and trust me…they’ll be coming back for more taste testing as the Easter festivities continue! 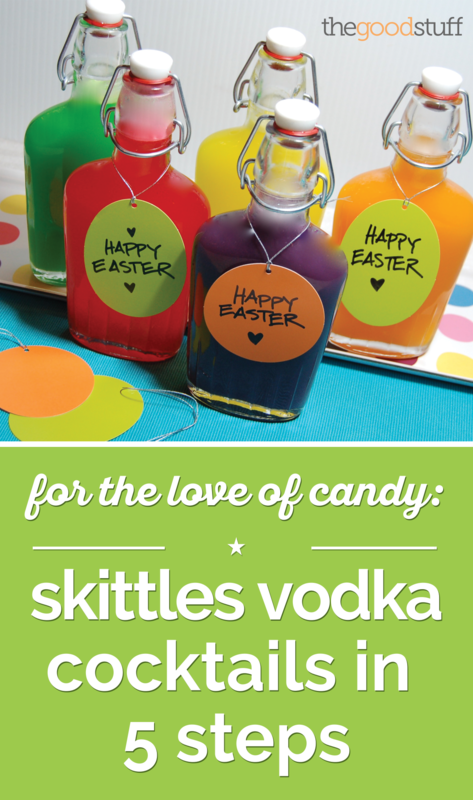 If you’re not hosting an Easter brunch yourself, Skittles® Vodka Cocktails make a great hostess gift! Simply add a nice hang tag (I got these from The Container Store) with a personalized note and your recipient will be thrilled at your thoughtfulness. 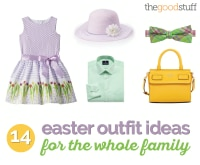 Get your bunny ears and Easter bonnets ready, as Easter is fast approaching! 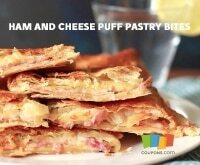 If you’re ready to put in about two days of planning and preparation, you can “Wow!” your family and friends with this colorful and tasty treat. So between the egg hunts and filling all those Easter baskets for the kids, it’s important to remember to have some adult treats, too — cocktails included!